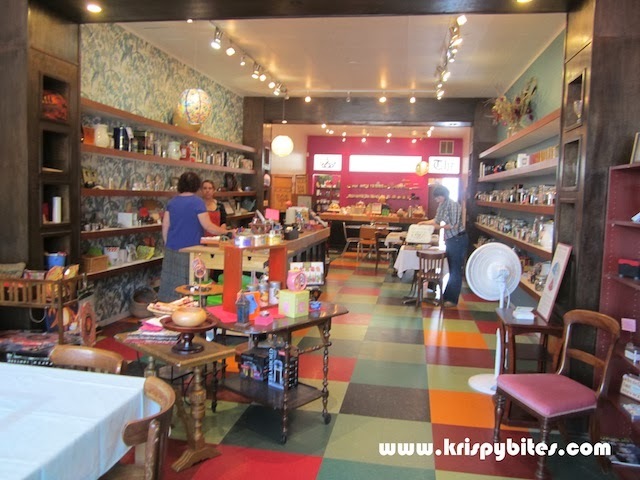 On my perpetual hunt for afternoon tea in Edmonton, I came to know of a quaint little store on Whyte Ave run by a sweet lady named Cally. 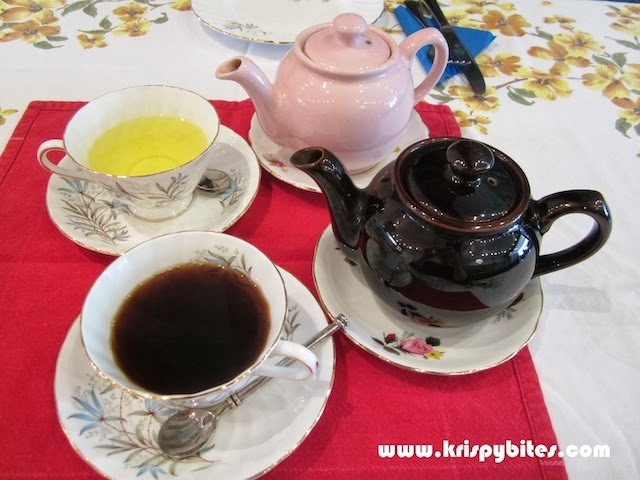 Cally's Teas sells a variety of loose leaf teas in addition to English dishes like beans on toast and Welsh rarebit. 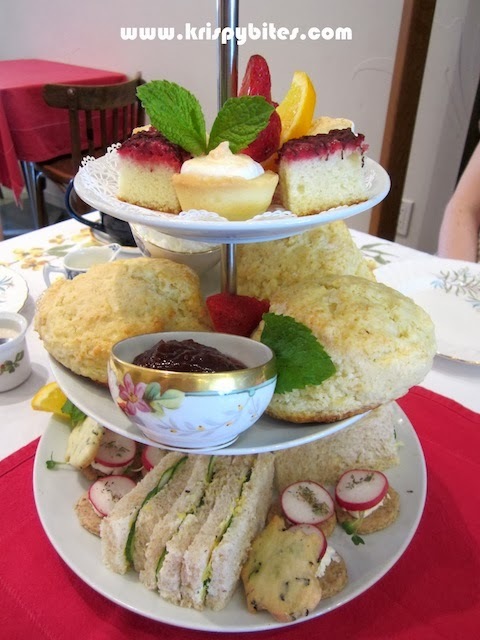 And of course there is traditional afternoon tea service with pots of tea, savouries and sweets. The interior decor is intimate with warm and cheerful colours; the space feels more like a cozy living room than a restaurant. In fact, the way Cally interacts with each customer is as if she were entertaining guests in her own home. 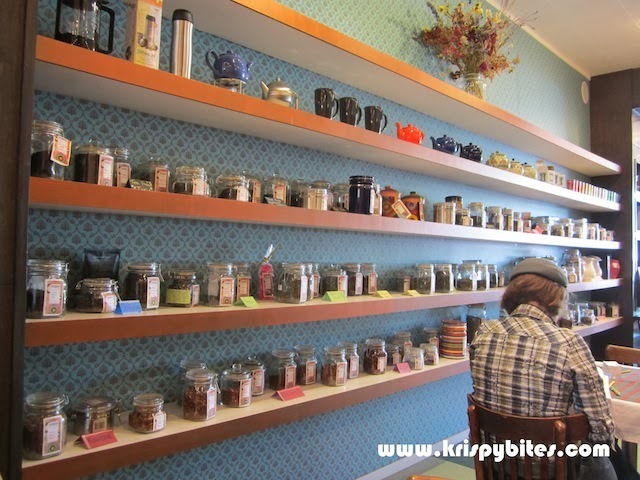 Along one side of the wall are tiers of glass jars filled with an impressive collection of loose leaf teas. Since we ordered the afternoon tea set, we could have our pick from amongst the vast selection. The person in the picture below was part of a group of young people, quietly studying and hanging out in the store. 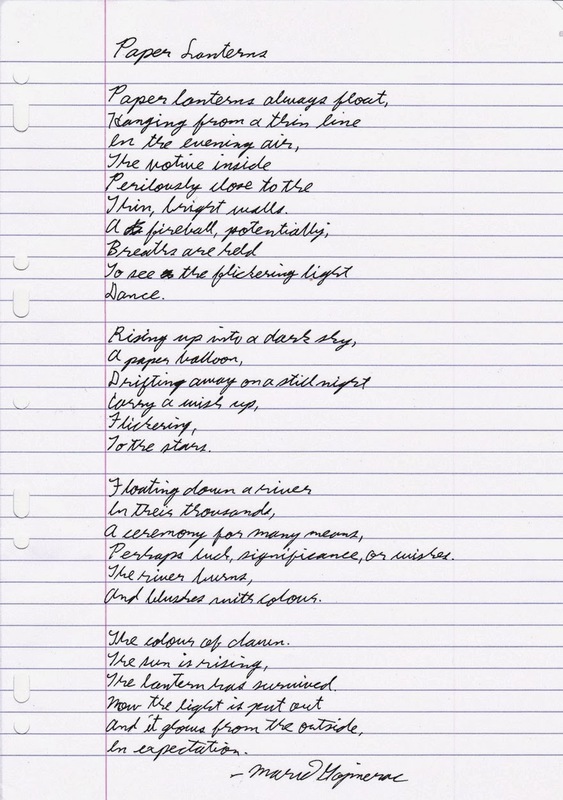 Cally told us they were English students who could write us a poem on any topic we specified, and we could take the poem home with us as a keepsake. Choosing a tea from the wall was no easy feat. In the end, I settled for a dark and mellow pu-erh tuocha. Tuocha refers to a mini nest of compressed pu-erh tea leaves. "There is a rosebud hidden inside!" I was told by Cally. I couldn't taste the floral flavour of the rosebud, but the earthy aromatic pu-erh was good enough for me. I've heard that beans on toast ($7 in Aug 2013; now $12.50) is a common English dish, but I've never actually tried it before. According to the menu, the beans are the only thing not made in house. 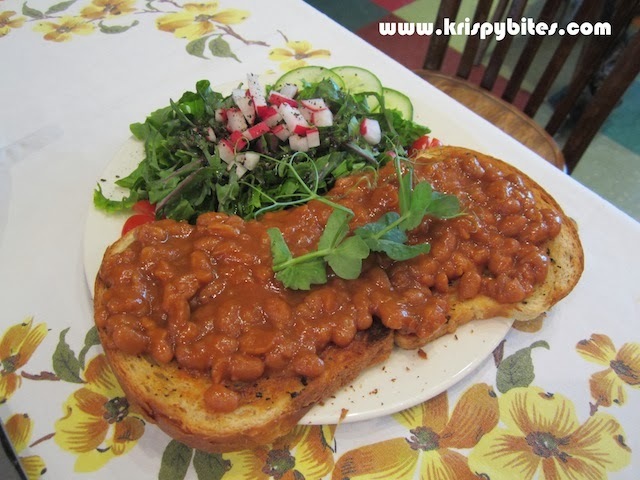 Canned beans on toast doesn't sound very appetizing, but it was much better than expected. The beans were so warm and satisfying that I can see this as the English equivalent of mac and cheese — the perfect comfort food. 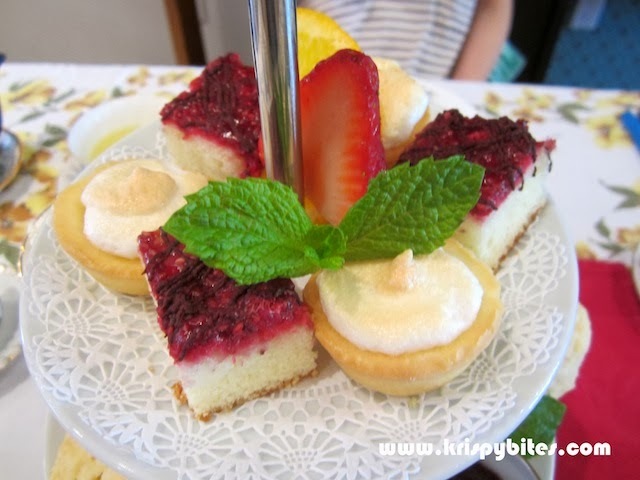 The afternoon tea set ($20 in Aug 2013; now $25) was a good portion for lunch. 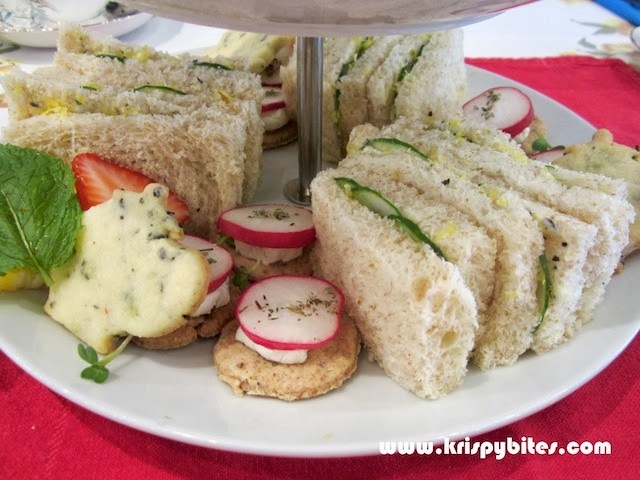 The bottom tier consisted of only one type of sandwich: cucumber with lemon zest. It was definitely a refreshing twist to plain old cucumber, but I thought the lack of variety was a bit disappointing. Then there were homemade crackers with goat cheese and radish. The crunchy-creamy combination complemented the bland crackers well. Last but not least on this tier, there was the shortbread with embedded tea leaves that lent a hint of aroma to the buttery biscuit. 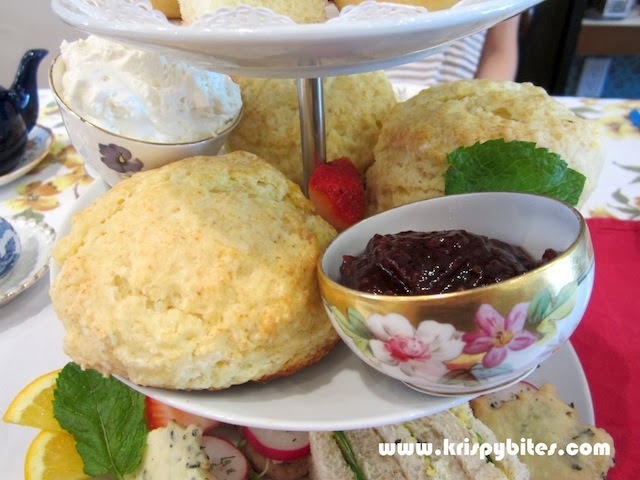 Classic English scones with cream and jam made up the middle tier. These were quite possibly the largest scones I've seen. The texture was less refined than the scones I'm used to, but there was a country charm about them. The exterior was crispy, while the interior was soft with coarse crumbs and a delicate aroma of butter. Cally told us there is an ongoing debate about whether cream or jam should be spread on first. The current practice in Devon is to put cream on first, followed by jam; in Cornwall, it's the opposite. Interesting anecdote to go with the scones. Desserts included chocolate raspberry cake squares and mini lemon tarts. The cake was light and spongy with a sweet-tart topping, but I didn't find it too memorable. The lemon tart had a very nice shortbread crust that wasn't too sweet. On my second visit, I decided to forgo the afternoon tea set and try some English dishes instead. Dippy eggs with toasted soldiers ($9.50) was an interesting name that caught my eye, and I asked one of the servers what it was. 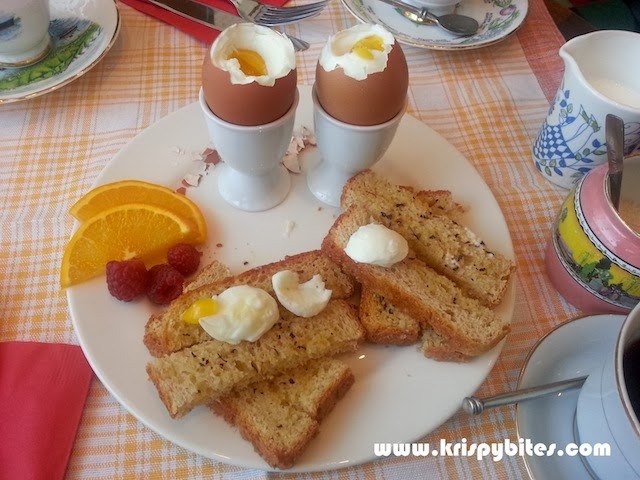 Apparently "dippy eggs" refers to soft-boiled eggs and "soldiers" are strips of toasted bread used for dipping into the semi-runny yolk. Although the eggs we got were not at all runny, they were still very tasty with the bread. 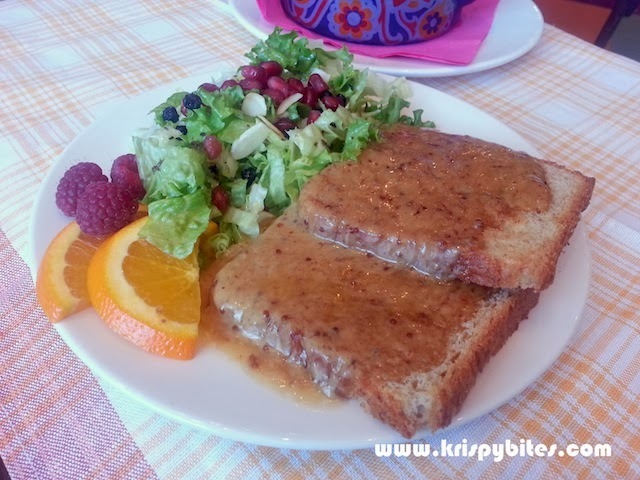 I was told that Welsh rarebit ($13.99) is a cheese mixture served over toast, so I had pictured something soft, warm and gooey, and maybe even a bit stringy like melted cheese on pizza. But this cheese mixture was hardened and not at all soft or gooey. The texture wasn't too pleasing — a bit reminiscent of leftover pizza — but the flavour was rich and full-bodied. I also enjoyed the side salad with fresh pomegranate seeds and dried blueberries. However with a price tag of $14, I would choose the beans on toast over this dish. Although the food at Cally's is definitely decent, I think the reason people come back is because of the personal and intimate experience. As I mentioned before, sitting and eating in the store feels like I'm enjoying a spot of tea and snacks at Cally's house, and not so much like I'm dining out. Cally truly makes customers feel welcome and at ease.